Trade card, C. B. Eaton & Co. Stationers, Worcester, Mass. Circa 1881 – 1892. C. B. was Charles B. Eaton, born about 1832, listed there on the 1880 Federal Census for Worcester, living at 690 Main St., occupation “paper store” with his wife Mary C. and daughters Alice C. and Cora B. Eaton. All are native to the state of Massachusetts. The time frame for C. B. Eaton & Co. was found in bookseller and stationer journals: Charles B. Eaton and J. Edgar Dickson succeeded Sandford & Dickson in 1879. Eaton & Dickson was then succeeded by C. B. Eaton & Co. in 1881 and C. B. Eaton & Co. was succeeded by Lewis & Emerson in January 1893 or possibly December 1892. Sources: Drew, Allis & Company’s The Worcester Directory, No. XXXIX, for 1882, p. 123. Ancestry.com. U.S. City Directories, 1822-1995. Drew, Allis & Company’s The Worcester Directory, No. XLI, for 1884, p. 386. Ancestry.com. U.S. City Directories, 1822-1995. Year: 1880; Census Place: Worcester, Worcester, Massachusetts; Roll: 568; Page: 444D; Enumeration District: 896. 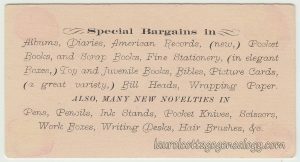 The American Stationer, Vol. 7, No. 23. June 5, 1879, p. 10. (Google.com ebook). The American Bookseller, Vol. 11, No. 1. January 1, 1881, p. 279. (Google.com ebook). 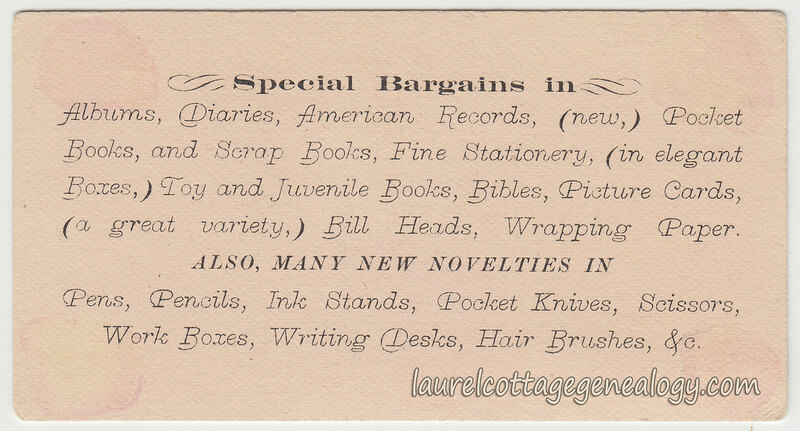 The American Stationer, Vol. 33, No. 1. January 5, 1893, p. 128. (Google.com ebook). 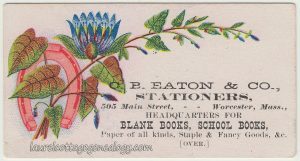 This entry was posted in Trade Cards and Advertising and tagged Charles B. Eaton Worcester MA family history and genealogy, history Worcester MA businesses, old trade cards with flowers and horseshoes by Annieoakley. Bookmark the permalink.